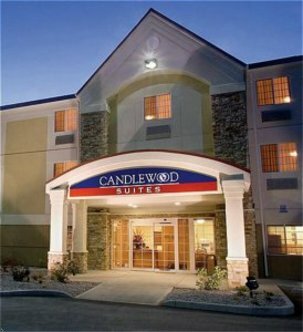 Come and experience our new Comforts of Home 53 Bedding Collection.The Candlewood Suite Detroit-Southfield Hotel is located in the business district of downtown Detroit Southfield and within close proximity to companies such as Federal Mogul, IBM, Morton&regs, GM, Chrysler & Ford to name a few. If traveling on pleasure you may visit Detroit&regs local teams, Red Wings at Joe Lewis Arena, Detroit Tigers at Comerica Park, or visit Ford Field to see our Detroit Lions. MGM Grand and Motor City Casino are located within a 15 minute radius.From the moment you enter the hotel you will enjoy the warm comforts of home. With two separate phone lines and free high speed internet access. Each room offers a full kitchen, VCR, and a CD player. Visit our Candlewood Cupboard where you can purchase meals, snacks and sundry items at value prices. So whether you here for the night or a month, take advantage of our comforts. Complimentary on-site fitness and laundry facility are always availableStudio and one-bedroom suites are available with weekly housekeeping. Each suite features living/sleeping area, full kitchen and private bathroom. Standard amenities include a 25" TV, VCR, CD player, hairdryer, iron, ironing board, desk and chair, multiple phone lines, voicemail, full-size refrigerator with icemaker, stovetop, and a full size dishwasher.Pet Friendly &reg Restrictions apply. This hotel is committed to providing accessible facilities under the American Disabilities Act. If your accessibility needs are not met, please contact the Hotel Manager on Duty. Should you require additional information regarding accessible facilities for guests with disabilities, please call 1-800-Holiday (U.S. and Canada) or contact the hotel directly. For the hearing impaired, TDD service is available at 1-800-238-5544 within the U.S. and Canada.